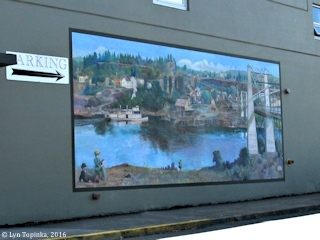 "Murals ... Oregon City, Oregon"
Click image to enlarge Willamette Falls, Oregon City, Oregon, with Mount Hood. Image taken February 19, 2006. 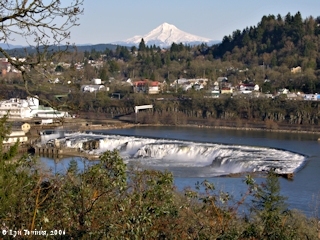 Oregon City is located along the Willamette River between River Miles (RM) 25 and 27. 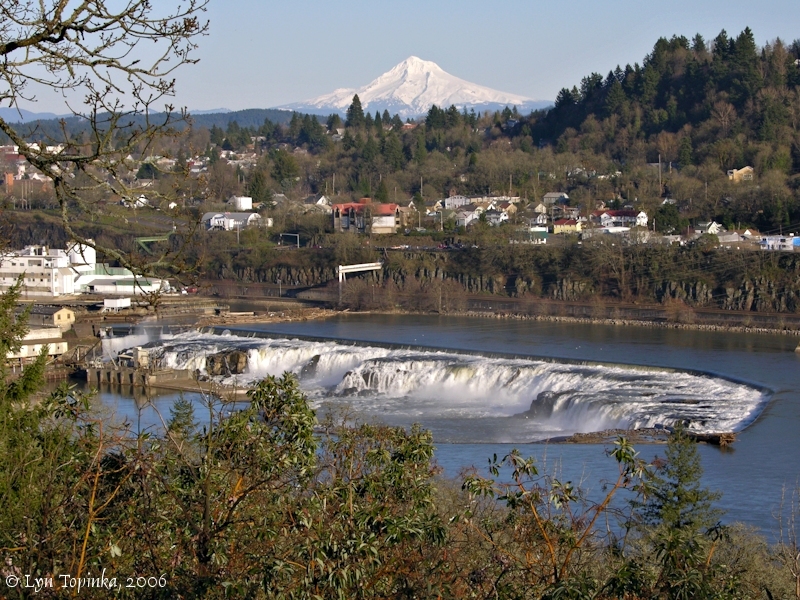 Oregon City stretches between the mouth of the Clackamas River and the Willamette Falls, a spot where the Willamette River spills about 40 feet over horseshoe-shaped basalt ridge. Lewis and Clark made many references to the "falls of the Multnomah" and the Indian tribe which lived there. The falls were a major salmon fishing location and and important part of the development of the community of Oregon City, as they furnished power for a lumber mill (1842), a flour mill (1844), a woolen mill (1864), and the first paper mill in the Pacific Northwest (1867). 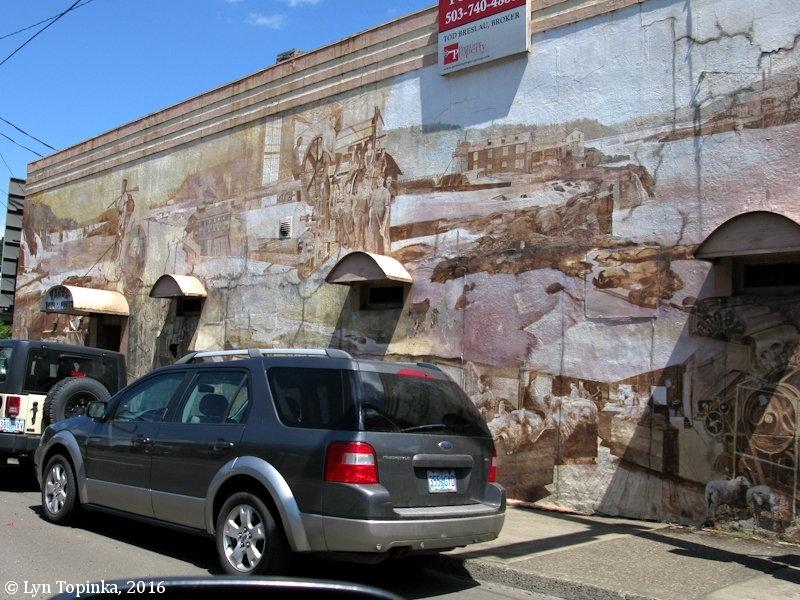 Click image to enlarge Oregon City Mural, Oregon City, Oregon. Image taken July 13, 2016. Click image to enlarge Oregon City Mural, Oregon City, Oregon. 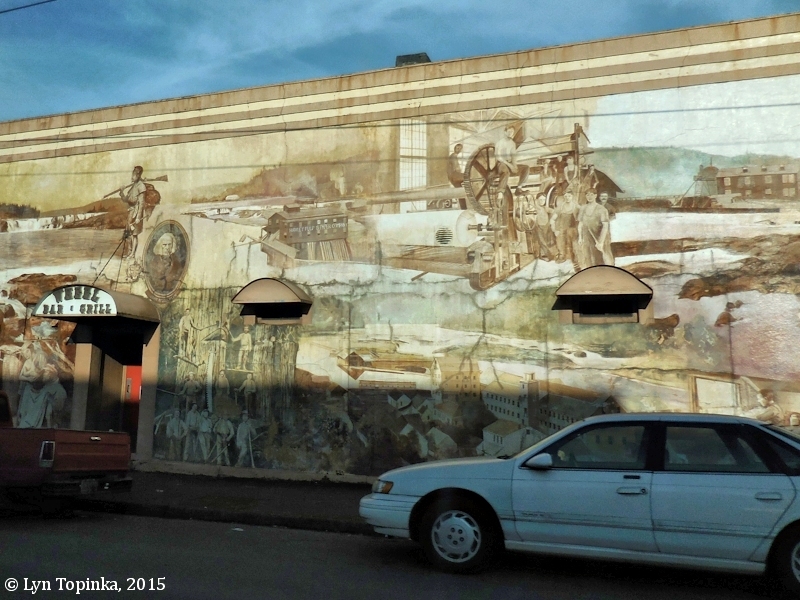 Image taken January 8, 2015. 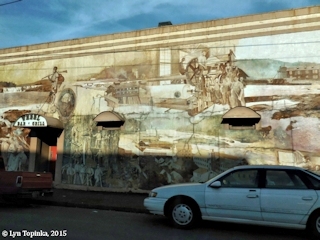 Click image to enlarge Mural, Joseph Meek, Oregon City, Oregon. Image taken July 13, 2016. 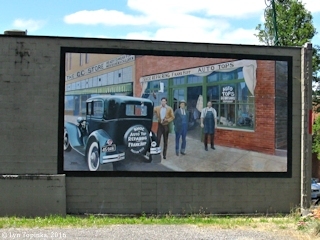 According to the "waymarking.com" website (2016), this Larry Kangas mural depicts the Frank Hopps repair shop on Main Street, Oregon City. Click image to enlarge Mural, Auto Top Repairing, Oregon City, Oregon. Image taken July 13, 2016. Painted by artist Larry Kangas. 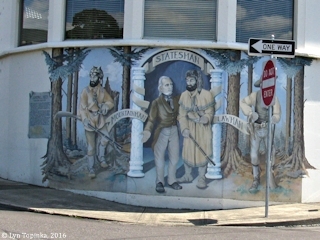 Painted in 2006 by artist Larry Kangas, who also did the Bridge of the Gods Mural located in Cascade Locks, Oregon. 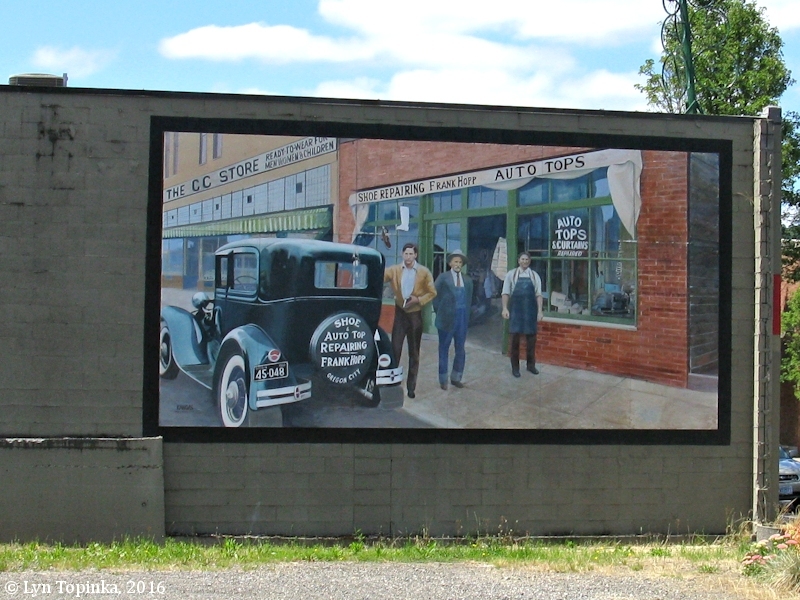 Click image to enlarge Mural, Early Oregon City, Oregon City, Oregon. Image taken July 13, 2016. 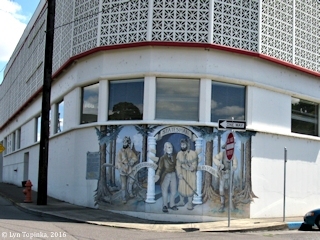 Painted by artist Larry Kangas, 2006. I left them [village near today's Portland International Airport] and proceeded on on the South Side [North Portland Harbor] of Image Canoe Island [Hayden Island] which I found to be two Islands hid from the opposit Side by one near the Center of the river. the lower point of the upper and the upper point of the lower cannot be Seen from the North Side of the Columbia on which we had passed both decending and ascending and had not observed the apperture between those islands. at the distance of 13 Miles below the last village [location of Portland International Airport] and at the place I had Supposed was the lower point of the image Canoe island [Hayden Island], I entered this river which the nativs had informed us of, Called Mult no mah River [Willamette River] so called by the nativs from a Nation who reside on Wappato Island [Sauvie Island] a little below the enterance of this river. Multnomah [Willamette River] discharges itself in the Columbia on the S. E. and may be justly Said to be ¼ the Size of that noble river. Multnomah had fallen 18 inches from it's greatest annual height. three Small Islands are situated in it's mouth [Belle Vue Point and Kelley Point, on opposite sides of the mouth of the Willamette, use to be islands] which hides the river from view from the Columbia. from the enterance of this river [Willamette River] , I can plainly See Mt. Jefferson [Mount Jefferson, Oregon] which is high and Covered with snow S. E. Mt. Hood East [Mount Hood, Oregon], Mt St. Helians [Mount St. Helens, Washington] a high humped Mountain to the East of Mt St. Helians [Mount Adams, Washington, is east of Mount St. Helens]. I also Saw the Mt. Raneer [Mount Rainier, Washington] Nearly North. Soon after I arived at this river an old man passed down of the Clark a'mos Nation who are noumerous and reside on a branch of this river which receives it's waters from Mt. Jefferson [Mount Jefferson, Oregon] which is emensely high and discharges itself into this river one day and a half up, this distance I State at 40 Miles. This nation inhabits 11 Villages their Dress and language is very Similar to the Quath-lah-poh-tle and other tribes on Wappato Island [Sauvie Island]. The Current of the Multnomar [Willamette River] is as jentle as that of the Columbia glides Smoothly with an eavin surface, and appears to be Sufficiently deep for the largest Ship. I attempted fathom it with a Cord of 5 fathom which was the only Cord I had, could not find bottom ? of the distance across. I proceeded up this river 10 miles from it's enterance into the Columbia to a large house on the N E. Side and Encamped near the house [downstream of Cathedral Park and the St. Johns Bridge, Portland, Oregon, near Portland's Terminal 4. ], the flees being So noumerous in the house that we could not Sleep in it. this is the house of the Cush-hooks Nation who reside at the falls of this river which the pilot informs me they make use of when they Come down to the Vally to gather Wappato. he also informs me that a number of other Smaller houses are Situated on two Bayous which make out on the S. E. Side a little below the house. this house appears to have been laterly abandoned by its inhabitants ... The course and distance assending the Molt no mar R [Willamette River] from it's enterance into the Columbia at the lower point of the 3rd Image Canoe island. S. 10° W. 3 miles to a Sluce 80 yards wide [Multnomah Channel] which devides Wappato Island [Sauvie Island] from the Main Stard. Side Shore passing a Willow point on the Lard. Side [???]. S. 60° E. 3 miles to a large Indian house on the Lard Side below Some high pine land. miles 10 passing a Larborad point [???]. thence the river bends to the East of S East as far as I could See [the stretch through Portland, Oregon]. at this place I think the wedth of the river may be Stated at 500 yards and Sufficiently deep for a Man of War or Ship of any burthern. The enterance of Multnomah river is 142 miles up the Columbia river from its enterance into the Pacific Ocean—.